Natural coastal erosion can have a dramatic effect on the appearance of chines. At Blackgang the original chine valley has now been lost completely as a result of intensive coastal erosion caused by south-westerly storms and unstable geology.Within the last forty years it was possible to gain access to the beach via the chine but now what remains of the chine itself is a small stream cascading over the cliff face. Changes to the cliff position caused by coastal erosion can cause new chines to be formed, and old ones to dry up. Near Chale a brook running to the sea formed Ladder Chine, then as the cliffs eroded the water found an easier route to these and forming Walpen Chine (or Old Walpen Chine) to the east. Now both of these chines are largely dry, with the brook having formed a new opening in the cliff still further east referred to by some as New Walpen Chine. 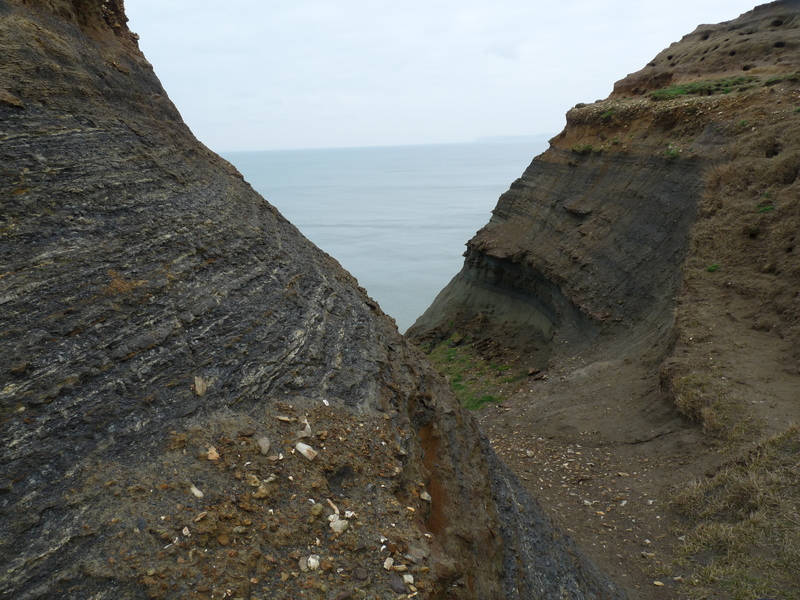 Some of the best examples of chines in their natural state are those occurring along the south-west coast where continued surface run off maintains the steep sided profile and the natural processes of weathering and erosion are able to continue. Along this coastline there are no plans for coastal defences because of the lack of buildings and the natural beauty of the changing, dynamic landscape. Chines are formed and sustained through a balance between competing erosion forces; erosion from surface run off and erosion from the sea determine how the landscape is shaped. If you walk along the beach you can see evidence of the battle between stream and sea. In many areas you can see water running off the cliff edge,sometimes eroding small channels, especially in winter. Where these flows are small and inconsistent they are unable to cut down through the soft cliffs very far before the channels are eroded away by the sea. At some locations you can see waterfalls dropping over the cliff edge where a new stream has developed and started forming a chine. 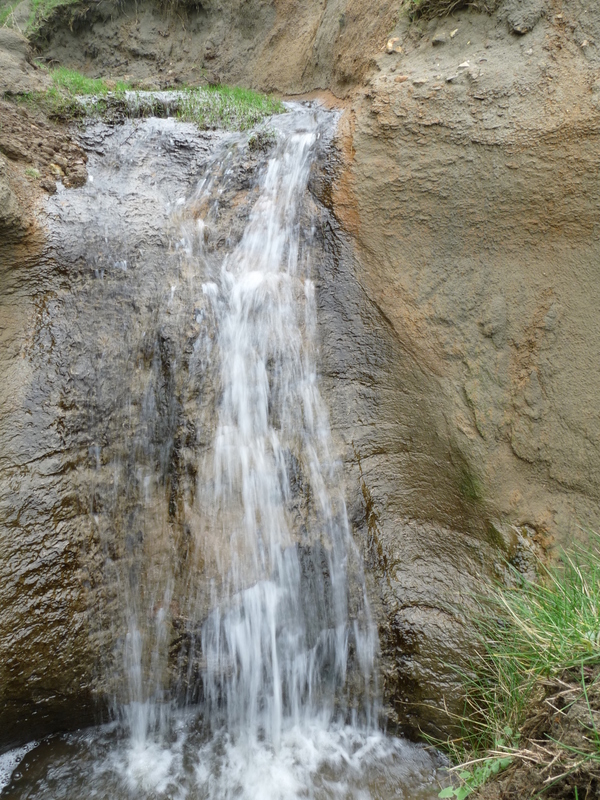 In other locations waterfalls appear where the flow through an old chine is fairly low and so the sea has eroded the cliffs back faster than the stream can cut through the rocks, leaving it hanging part way up the cliff. At other points you can see a distinctive chine structure, with water flowing out at beach level,suggesting a more stable chine. Elsewhere you will find remnants of a chine shape but with no water, where the supply has been diverted elsewhere. Most of these chines have been significantly eroded by the sea (for example Small Hope Chine at Shanklin) and some chines have disappeared completely. Coastal protection works at the foot of a chine prevents further cutting back and encourages chines to stabilise. This leads to a gradual infilling of the chine and vegetation is able to colonise. This is the case at Widdick Chine and, to a lesser extent, Shanklin Chine. Changes in water flow can also affect the shape and form of chines. Between Brook Chine and Hanover Point is the relatively newly formed Churchill Chine. This must have originated from the diversion of water flow from somewhere nearby. In 2010 drainage works increased the flow of water into the chine which may accelerate its development. Shepherds Chine captured the flow of water from the now largely dry Cowleaze Chine possibly by re-routing of the flow by a shepherd in around 1820.